A fine and unique Antique Inlaid Arts & Crafts Writing Desk. With many interesting design features and exceptional craftsmanship this is a rare piece of furniture from this era. 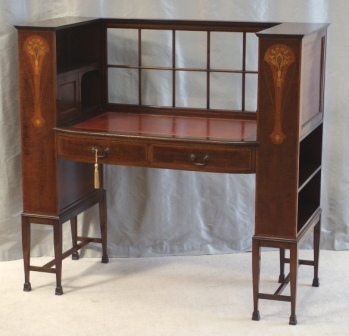 Particular features of this Ladies Arts & Crafts Writing Desk are the glazed rear gallery and the fine inlay work to the pedestal towers and the drawer and cupboard fronts. The exceptional cabinet making extends to the fitted interior of each cupboard by the sides of the red leather writing surface. Overall a wonderful piece of Arts & Crafts Writing Furniture. Drawer internal heights = 2.75" (7cm).